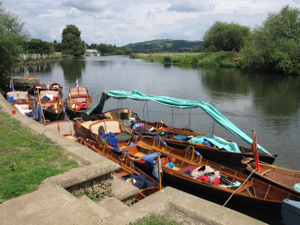 The Society was founded in 1980 to promote the continued use and conservation of traditional, non-powered craft, mainly Skiffs, Dinghies, Punts and Canoes. During the summer months, weekend and longer cruises are organized and rallies, regattas and festivals on waterways in the UK and abroad are attended. During the winter months social events with a boating theme are arranged. Whilst the Society’s interests centre around the traditional hand-built timber craft so popular in Victorian and Edwardian times, all unpowered boating is encouraged, members with other types of boat are most welcome and you do not have to own a boat to join the Society. We produce a quarterly magazine which reports on any activities, relevant news items and members may advertise boats etc. for sale. In between we send out Bulletins occasionally to remind everyone of forthcoming events. We do use e-mail for this where possible but otherwise members receive a hard copy. Our members come from all walks of life; some have grown up with boating and for others it is a new pastime when time allows. Many members own boats, some of which have been in families for many years, but anyone interested is welcome to come along to events. Often on day cruises there are spare seats in boats and an extra crew member to cox or scull can be very welcome! If you are not very practised there will be someone to advise and pass on helpful hints on improving your style. Several members are expert craftsmen and restoring and maintaining craft is always high on the agenda of any gathering. Again, advice on what to use and how to do it is always at hand. Not all our boats are historic and traditionally built; all hand propelled craft are of interest.